California state officials are floating the idea of allowing commercial advertising on freeway and interstate highway information signs as a means of raising revenue. 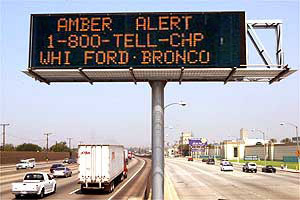 This is a reckless idea that co uld make these roadways less safe, more congested, and diminish the effectiveness of the “Amber Alerts” that flash on these signs when a child abduction has taken place in the area. This ongoing commercialization of the visual environment is a huge threat to public space that belongs to all of us, not just to the outdoor advertising industry and their clients.